Within hours of President Trump’s signing of Executive Order 13769 on January 27th—better known as the “travel ban”—protestors, concerned family members, and the media all flocked to international airports across the country. 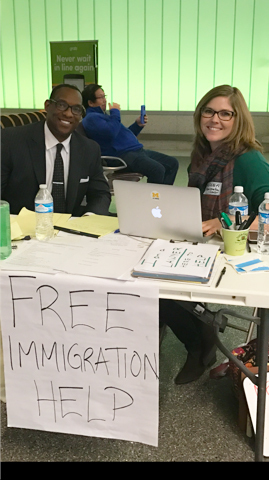 Over the weekend, crowds grew and included large numbers of volunteer attorneys looking to help however they could. Several Northwestern Law alumni shared their experiences and their hopes moving forward. Alanna Holt and a colleague assist at LAX. By the end of her first shift, Holt knew her services were still needed and she returned to LAX’s international terminal the next day. Halfway across the country, Emily Dillingham (JD ’06) was one of the volunteers helping to put advocacy processes in place at O’Hare. An associate with Arnold & Porter Kaye Scholer, she received an email from the International Refugee Assistance Project (IRAP) the weekend the order came down, asking available attorneys to come to O’Hare’s Terminal 5. In the weeks that followed, Dillingham served as a shift leader multiple times and helped with the administrative work of organizing volunteer attorneys to staff the terminal around the clock, even after the executive orders were stayed in court. Ginger Devaney (center) joins the group of lawyers assisting at O'Hare in the week following the executive order. 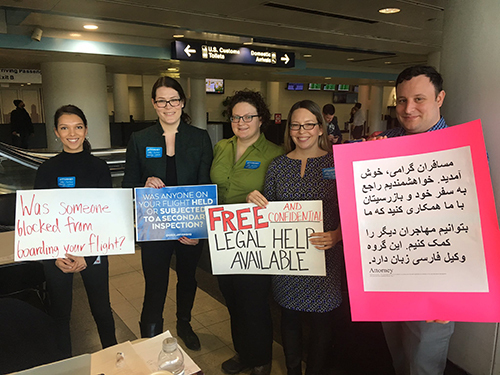 Ginger Devaney (JD ’14), an immigration attorney with the Chicago-based Domestic Violence Legal Clinic, joined the group of volunteer lawyers staffing O’Hare in the middle of the first week of the initial executive order. Devaney was distressed by what she heard from clients and what she saw in action. On February 9, the Ninth Circuit Court of Appeals upheld a temporary restraining order on the travel ban. On February 16, the Trump administration announced its intent to issue a revised order, and issued Executive Order 13780 on March 6. The revised order was challenged immediately, and a temporary restraining order became an indefinite preliminary injunction on March 29. The Trump administration has said it will continue to fight on behalf of the order. Many immigrant advocacy organizations say despite the stay, legal assistance is still desperately needed and they have sustained a presence at airports and in communities that are fearful about what might come next from the administration. The organizations and relationships many attorneys formed on a grassroots level in the wake of the travel ban have laid a groundwork for an apparatus to fight where they see injustices. “If anything, the revised order has galvanized the attorneys working on this issue. We have changed our name from the O’Hare Legal Team to the Chicago Legal Responders Network, as the group evolves from one handling the travel ban to one available to respond to other challenges to civil rights that may arise from the actions of this new administration,” Dillingham said. Dillingham is also working with attorneys from her firm and partnering with Muslim Advocates, Americans United for Separation of Church and State, and the Southern Poverty Law Center to bring a lawsuit in the D.C. District Court seeking an injunction of the revised order. Oral argument on a preliminary injunction motion is scheduled for April 21. “I’m incredibly proud of the work that we’re doing,” she said. Holt, Devaney, and Dillingham all stressed the need for more involvement from those interested.